There is a debate about the path to cognition. Will it be a statistical big data approach or a more biologically directed strategy? What does this group think? 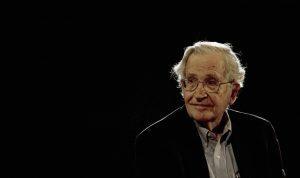 Re: Noam Chomsky Has Weighed In On A.I. Where Do You stand? From my very limited knowledge of the field, neuroscience research has a very long way to go before we can anything in the way of usable intelligence out of it. A hilarious paper about this is Could a Neuroscientist Understand a Microprocessor? (answer: probably not). A purely statistical approach is also wrong, and fails at many things already (language understanding, policy learning in complex environments). It's pretty clear that intelligence is not just about prediction. However, I would say that prediction (and statistics) is a major part of intelligence. Many recent advances are a combination of some statistical approach and some logical, planning based approach. AlphaGo/AlphaZero is a good example of this. Learn a policy net and a Q-net (statistics) in order to make quick judgements and estimates about the board-state/current move. Then use MCTS as a powerful planning method to systematically plan many steps into the future. This is extremely similar to how humans play board games like go and chess -- have some powerful intuitive (statistical?) ability to evaluate the current position, combined with a relatively small amount of rollouts/planning which goes deep into the game tree. The same for many reinforcement learning tasks -- no, you don't want to just have a policy network which outputs a probability distribution of what to do next time-step, because that's a very "reactive" policy that will never be able to plan far into the future. Instead, have some sort of planner (can be hard-coded OR learned) which puts together a plan, and then use the policy net (statistics) to execute the plan. This is pretty similar to how humans act. If I want to open a box, I quickly come up with a plan (grab the scissors, cut the tape, open cardboard box), and then the execution is left to the motor systems, which have been trained for a very long time on a lot of experience (statistics). So no, you can't do it with only statistics, but you also can't do it without statistics. It's the ones that learn that are the powerful (scary) ones. How did you come up with this plan? Would you have come up with this plan the first time you ever saw a box you wanted to open? As with any human endeavor, truth usual resides somewhere in the middle. What we haven't figured out, is how to create that executive function planner. AlphaGo and it's successor AlphaZero are perhaps the most impressive examples of hardcoded planning (simply search the game tree using guided MCTS). On the learning to plan front, I recently found this great paper (https://arxiv.org/abs/1704.05526) which first trains many neural network (modules) on simple tasks, and then uses another neural network to output a *plan* of how to assemble the many neural modules into a single network which accomplishes the task. This kind of raises the question: If relying on statistics alone is not good enough, and some sort of planning is needed -- can the planning be done via statistics too? Proof are a good example of "pure reasoning", but in practice they're heavily guided by intuition, which is some sort of learned statistical bias which humans use to prune the huge search space -- so perhaps humans use statistics to plan as well.